Maserati aims to cut fuel use by 25% in the new Quattroporte (current version shown). BILBAO, Spain – Maserati will add stop-start technology and four-wheel drive to its next-generation Quattroporte flagship sedan. The luxury sports car maker aims to reduce fuel consumption by 25 percent in the new Quattroporte, CEO Maserati Harald J. Wester said. Stop-start and a weight reduction of 15 percent compared with the current car are among measures planned to help boost fuel economy, said Wester, who is also CEO of Fiat subsidiary Alfa Romeo. Others are downsized V-6 and V-8 engines, as well as the adoption of ZF Friedrichshafen AG's eight-speed automatic transmission, which already is available in the BMW 7 series and Audi A8 upper-premium models. 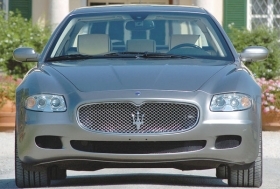 Adding four-wheel drive will help the Quattroporte compete better with rival cars from Audi, BMW and Mercedes-Benz, which offer the technology. Wester said Maserati's global sales are on track to be 15 percent higher than last year when the brand's volume was 4,489, nearly 49 percent lower than 2008. He was speaking at the Automotive News Europe Congress here last week.